Being a parent requires hard work, sacrifice, commitment, emotional support, time, and love. What about raising a child that is not your biological child? News flash, all of the above still apply. Don’t get it twisted, not everyone has what it takes. In the world of child rearing, there are no shortcuts. Raising children in today’s society presents even more challenges. Social media, violence, teen pregnancy, drugs, bullying, and peer pressure are some issues a child has to navigate every time he or she leaves the comfort of home. TD is a Baltimore native who raised her daughter and her sister primarily on her own. She managed to ensure that they accomplished their goals by setting an example for them to follow. TD focused on her education and maintained employment even during their early stages of life. Now that they are approaching young adulthood, she is receiving a return on her investment! Below is our conversation. Moetips: You’ve managed to raise your sister to be a successful young woman. You play an active role in her life. She recently graduated from college, has no children, health conscious, and is still pursuing goals. What’s next for her? How did you manage to raise her and your daughter while pursuing your own dreams? TD: Mariah recently graduated from college with a BA in African American Studies and in the fall she will be pursuing her RN degree from a local university. When Mariah was young, our mother was disabled and our father was deceased which presented many challenges. For the most part, Mariah was an agreeable kid and I assured her that I would support her with this transition. It came to the point where I had to put my dreams and goals on hold. I knew that I did not want the same upbringing for my sister and my daughter. I did not have a positive example when it came to parenting, but I knew what I did not want for them. I did my best to instill morals and values, the importance of goal setting, and an open line of communication. I encouraged them to be successful in school and we went on family vacations and spent time together on the weekends. I decided to live my life in a way to set a good example for them. Moetips: Your daughter attends a prestigious magnet school and is an active participant in many school activities. How did you manage to keep her away from the issues youth face today? 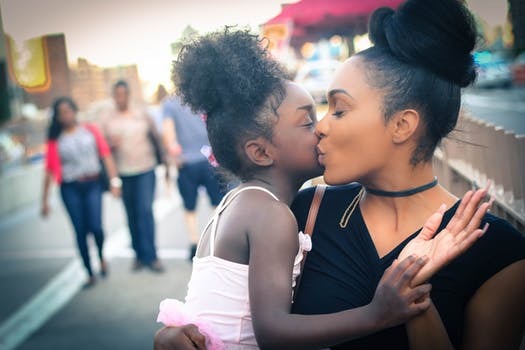 As a single parent, how involved are you in her education? Is she self-motivated? TD: When I enrolled Jordan into kindergarten at a Baltimore City public elementary school, I knew by the end of the year she would no longer be attending the school. I have always been active in her education because I did not want to see her railroaded by the school system like so many children are. By the third grade, Jordan was attending a progressive charter school for grades K through 8 in Baltimore City. At that school, Jordan was able to acquire the necessary tools to be successful in her education. After spending five years at a charter school, we believed it was time to go back into the public school system. She was accepted into a Baltimore City magnet public high school geared towards college prep and also an IB school for young adults. Jordan and I both have conversations about her college choices, career path, and her future plans. Jordan is a self-motivated young woman with a promising future. Moetips: Co-parenting is not easy for many people. What are some tips you can offer on a successful co-parenting relationship? TD: I did not sign up to be a single parent. I always had an ideal image of what I wanted my family to look like. At one point in my life there came a time when I realized that ideal image wasn’t going to happen with my current circumstances, and it made life difficult. I saw the separation as being a failure. It wasn’t long before we decided that we were going to do what was in the best interest of the child. We believed that she deserved access to a mother and a father. Some tips: letting go of any resentment that you have towards the other parent and work in the best interest of the child. Lastly, be present in your child’s life. It makes a difference! In conclusion, parenting is a life-long commitment. Even as your children approach adulthood, they still need guidance, support, and encouragement from you. As TD stated, nothing is more important than being present. It is up to you, the parent to nurture your child and lead them on the path to success. Thank you TD for enlightening our community!